Managing risk and promoting sustainability in global supply chains has been a hot topic for over a decade. However, there is still a lack of actionable frameworks to address these pressing challenges. Cases like Foxconn in China and Rana Plaza in Bangladesh have shown that risks remain high for both companies and workers. 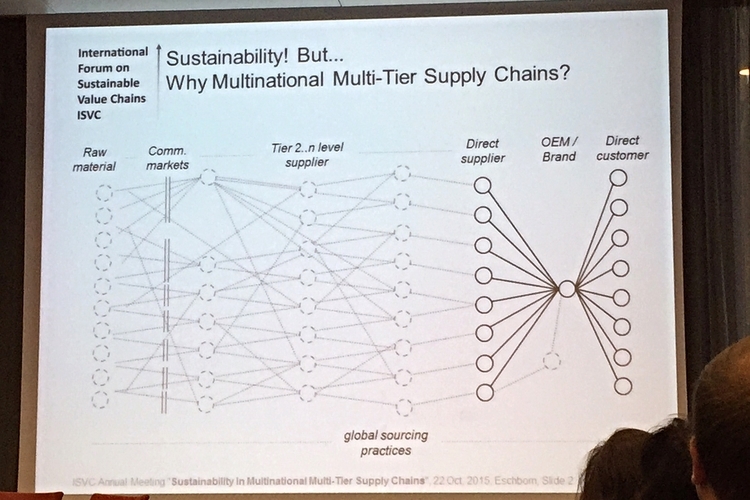 Last week’s International Forum on Sustainable Value Chains (ISVC) conference was focused on the theme: “Managing Sustainability Challenges in Multinational Multi-Tier Value Chains.” The event, held in Frankfurt, Germany promoted interactive discussion between academics and practitioners. It was encouraging to see organizers ask participants from business, government and academia to look beyond the superficial first tier of suppliers and to embrace the full complexity of modern supply chains. Unlike similar conferences, the ISVC set forth a new format to wrestle with these issues. On day 1, business representatives and policy makers discussed supply chain challenges around a set of guiding questions. The guiding questions pointed to highly relevant yet understudied aspects of supply chain management: (1) How to integrate sustainability into regular procurement, (2) how to follow-up on massive supply chain auditing, (3) how to identify relevant sub-suppliers, and (4) how to map product-group value chains. The objective of these four sub-themes was to get a better understanding of (1) the structure of current value chains (mapping! ), (2) the social and environmental risks that are embedded in these complex structures, and (3) possible strategies to respond to these challenges. Day 2 required the academics in the group to build on the previous day’s discussions and identify critical research elements. The debate on day one was predictable. The practitioners confirmed the relevance of supply chain transparency and the need to look into sub-supplier networks to adequately assess risks. Yet they also pointed out that “full supply chain transparency is not feasible” and “one has to start somewhere”. There was broad consensus that the starting point lies in auditing tier 1 suppliers. In terms of adequately assessing the actual risks, however, this may be a misinformed strategy. Instead, I would propose to first seek to identify the full spectrum of suppliers, and from there, move to deciphering which ones need the greatest support. Our research on the garment supply chain in Bangladesh shows that human rights risks in deeper layers of the supply chain are less monitored (if at all) and likely to be more severe than in tier 1 suppliers. A recent research report by the Ashridge Centre for Business and Sustainability at Hult International Business School, and the Ethical Trading Initiative (ETI) concluded that 71% of companies believe there is a likelihood of modern slavery occurring at some stage in their supply chains, yet it is complex, hidden and challenging to address. A chain is only as strong as its weakest link, so in terms of prioritizing efforts, targeting the weakest link makes most sense to me. The feasibility of this type of risk assessment of course depends on the principled commitment of corporations to increase supply chain transparency. In terms of effectively addressing supply chain risks and establishing fundamental human rights, the audit methodology should be challenged instead of passively accepted. It is an open secret among sustainability experts that auditing has not moved the dial significantly on systemic issues like excessive overtime and wages and is unable to identify (let alone remedy) sensitive issues like harassment and abuse. It is therefore necessary to develop alternative approaches that are better suited to effectively address human rights issues in global supply chains. A group that is currently in the process of developing such an alternative approach for sustainable supply chains is the World Economic Forum’s Global Agenda Council on Human Rights. Their White Paper on ‘shared responsibility’ will be published in early November. To advance the debate, academics can offer guidance by asking the right questions. They can also assist in developing alternatives to business as usual approaches for sustainable supply chains. But companies, policy makers and other key supply chain actors need to pick up the agenda and drive the implementation process. Dorothée Baumann-Pauly is the Center's Research Director and Tara Wadhwa is the Center's Assistant Director.